At least that’s what the United Brewers Industrial Foundation sought to convince the American people in 1937. When Prohibition ended in 1933 with the ratification of the 21st Amendment, it signified the renaissance of the legal alcohol industry. In an effort to improve the beverage’s reputation, the foundation published a series of pamphlets, including “At Home with Beer“ and “Beer – The Liquid Food,” hailing beer as a smart and wholesome addition to the daily menu. Pamphlet published by the United Brewers Industrial Foundation, ca. 1937. Source: Indiana State Library. 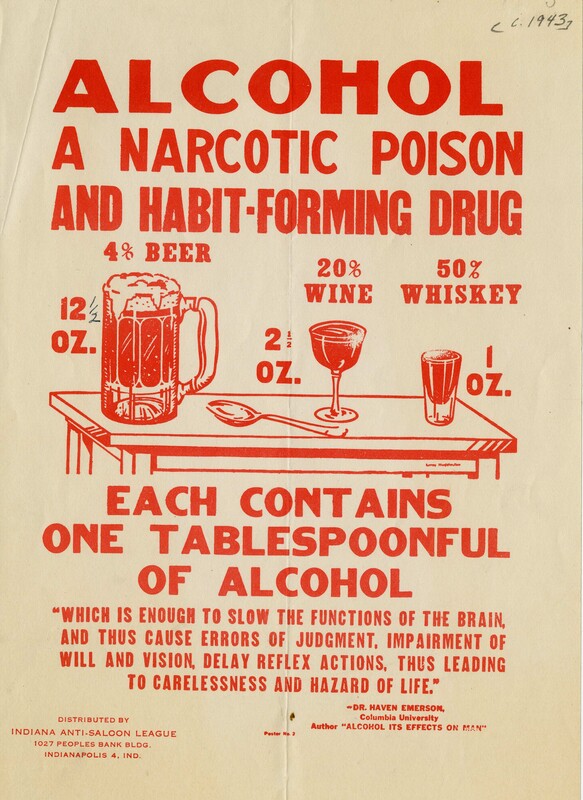 Despite this fresh spin, the brewing industry had a tough sell with opposition from organizations like the Indiana Anti-Saloon League, who were still calling all forms of alcohol “a narcotic poison and habit-forming drug” 10 years after Prohibition’s end. Broadside distributed by the Indiana Anti-Saloon League, ca. 1943. Source: Small Broadsides Collection, Indiana State Library. Before Prohibition, Indiana had a respectable brewing industry. In 1879, the Hoosier State ranked 12th out of 43 states, and two territories, with 191,729 barrels of beer sold and 10th in the number of breweries with 76. 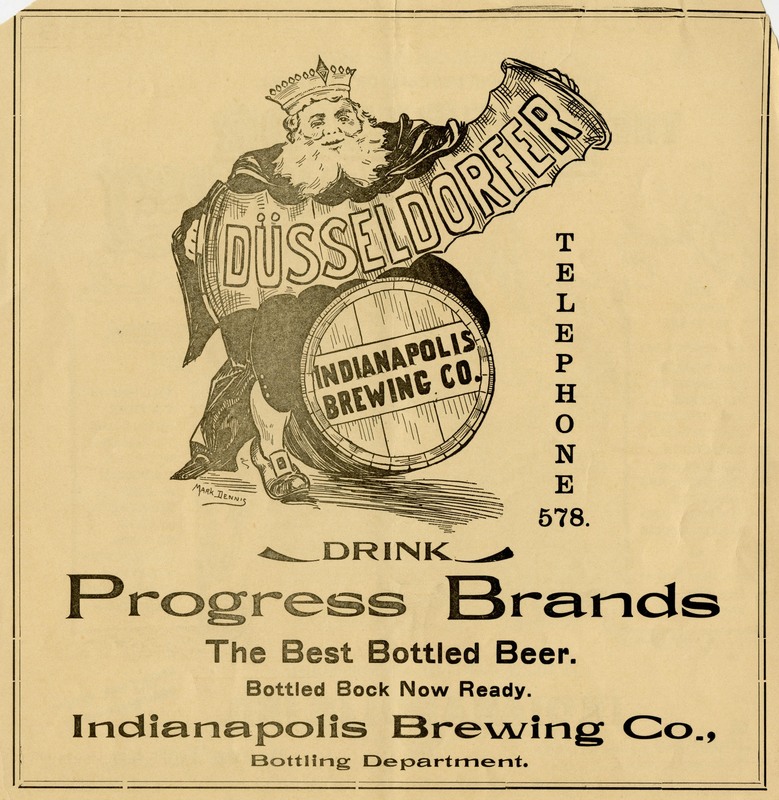 Some Indiana beers even achieved international renown, such as the Indianapolis Brewing Company’s Düsseldorfer, which won gold medals at the Paris Exposition of 1900, the St. Louis World’s Fair in 1904 and at Liege, Belgium in 1906. Advertisement for Indianapolis Brewing Co.’s Düsseldorfer beer, ca. 1900. Source: Indianapolis Brewing Company and Excelsior Laundry ads (S1881), Indiana State Library. 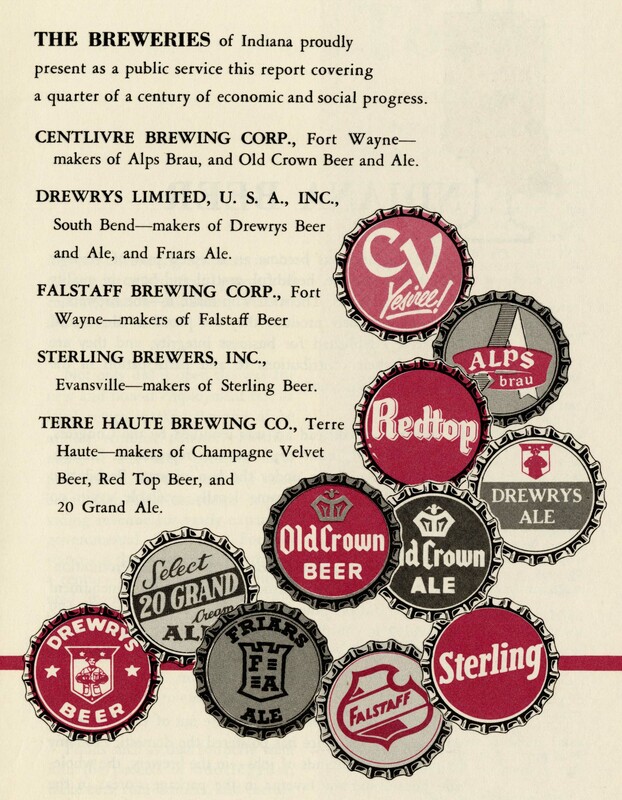 After the Prohibition’s repeal in 1933, many of Indiana’s breweries resumed operations, including the Indianapolis Brewing Company, Drewrys Limited in South Bend, Falstaff Brewing Corp. in Fort Wayne and Sterling Brewers in Evansville. In the following decades, many local American breweries, such as these four, eventually closed or were bought out, unable to compete with the national brands like Budweiser and Coors. 25th anniversary report of the Indiana Brewers Association, 1958. Source: Indiana Pamphlets, Indiana State Library. Beer has endured as a staple throughout human history, for both nourishment and enjoyment. 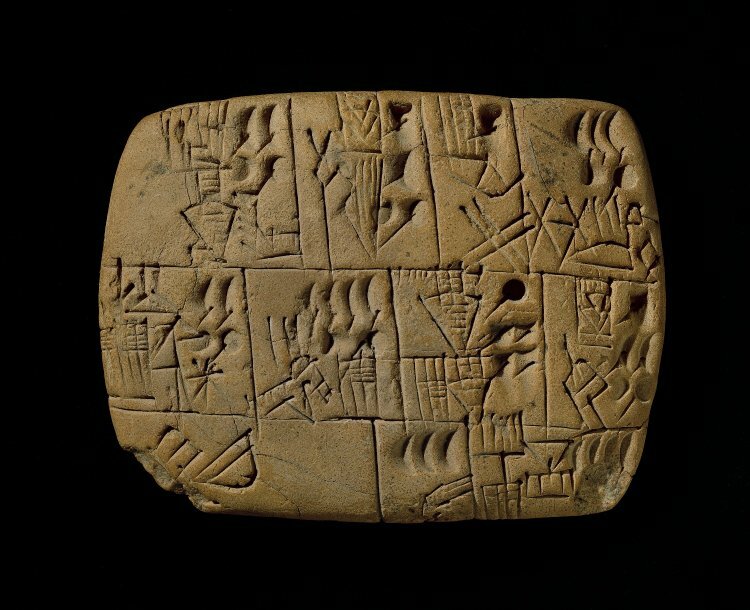 The oldest surviving recorded “recipe” for beer making is found in an ancient Sumerian tablet called the “Hymn to Ninkasi”—the goddess of beer and brewing—dated 1800 B.C.E., but brewing practices originated much earlier. Archaeologists have discovered evidence of beer and brewing in Mesopotamia and China going back at least 5,000 years, and suspect its existence as early as the Neolithic period. Sumerian cuneiform tablet recording beer rations, ca. 3100-3000 BCE. Source: Trustees of the British Museum (CC BY-NC-SA 4.0). Historically, beer making often began in the home. In ancient Sumer, the first brewers were the priestesses of Ninkasi and brewing, typically associated with baking, became part of women’s regular meal preparation. By and large, beer in the Western world was homemade until the Renaissance period when brewpubs and monasteries became the focal point of brewing activities. Brewing practices changed once again when, as in other trades, industrialization made large-scale commercial operations profitable in the 19th and 20th centuries. The growing trend of home brewing in the 1970s and 1980s, which led to the modern craft beer movement, could be considered a throwback to older brewing traditions, even while employing modern beer making methods. As a result, today’s beer industry is a hodgepodge of massive beer enterprises and thousands of smaller brewing operations, such as microbreweries and brewpubs. The craft beer movement reinvigorated an otherwise stagnant brewing industry, infusing innovation and new flavor into a timeless beverage. Today’s proliferation of diverse drafts and bottled brews would surely have pleased these Indiana soldiers clearly in need of a pint, if the graffiti is any indication. Ironically, these thirsty Hoosiers in want of beer returned from fighting a war in 1919 only to discover that Indiana had gone completely dry the year before their return. WWI soldiers returning home to Indianapolis, May 7, 1919. Source: Harry Coburn, World War I, 1917-1918 film, Indiana State Library. Kohn, Rita. “A History of Indiana Beer: Repeal through Today.” NUVO, September 16, 2016. Accessed June 18, 2018. Kohn, Rita. “A History of Indiana Beer: Settling Indiana and Indianapolis.” NUVO, September 14, 2016. Accessed June 18, 2018. Ostrander, Bob and Derrick Morris. Hoosier Beer: Tapping into Indiana Brewing History. Charleston, SC: The History Press, 2011. Salem, F. W. Beer: It’s History and Its Economic Value as a National Beverage. Hartford, CT: F. W. Salem & Company, 1880. Schreiber, Helen Watts. 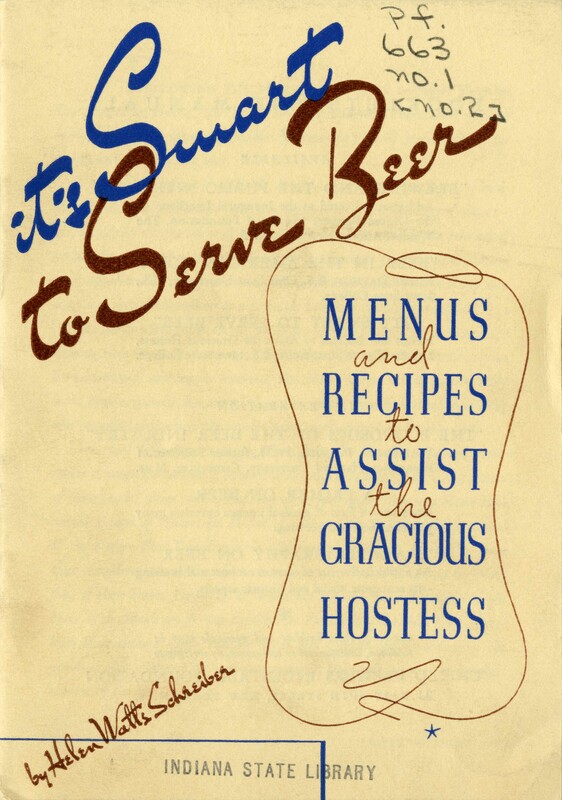 “It’s Smart to Serve Beer: Menus and Recipes to Assist the Gracious Hostess.” New York, NY: United Brewers Industrial Foundation, ca. 1933. Smith, Peter. “A Sip from an Ancient Sumerian Drinking Song.“ Smithsonian.com, June 18, 2012. Accessed June 18, 2018.